Cornwall – or Kernow as they say in Cornish – is home to mile upon mile of dramatic coastline, golden sands, rolling countryside, rugged moorland and picturesque fishing villages. It really is no surprise that this is one of the foremost holiday destinations in Europe. 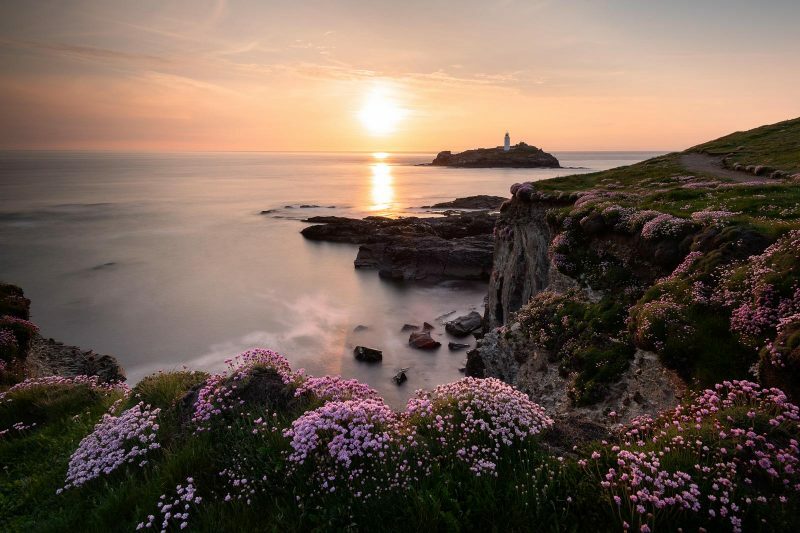 It is also one of the most photogenic counties in the UK; so if you are a keen landscape photographer, you really need to begin planning a road-trip to Cornwall in order to capture its breathtaking scenery. Cornwall is photogenic throughout the seasons, but in the summer months the coast is crowded with holidaymakers, which can make photography challenging. It tends to be quieter during autumn and winter when the coast can be stormy and dramatic. In spring, the cliff tops are carpeted in wild flowers, adding interest and colour to large, sweeping views. But whatever time of year you decide to visit, you won’t be short of landscape photography opportunities. Cornwall is a big county boasting some amazing locations and viewpoints – why do you think I live here!? Selecting the 10 best places for landscape photography in Cornwall is a thankless, almost impossible task, but my choices will hopefully get your started and inspired. Enjoy your visit… and don’t forget to have a pasty and Cornish cream tea while you are here! Sandymouth Bay, late evening light, near Bude, Cornwall, UK. April 2015. Located just a few miles north of Bude – not far from the north Devon border – Sandymouth Bay is home to a large sandy beach, stunning geology, and its very own waterfall. The twisted rock strata and colour of the cliffs will appeal to photographers who enjoy shooting the ‘miniature landscape’ and capturing detail and form. 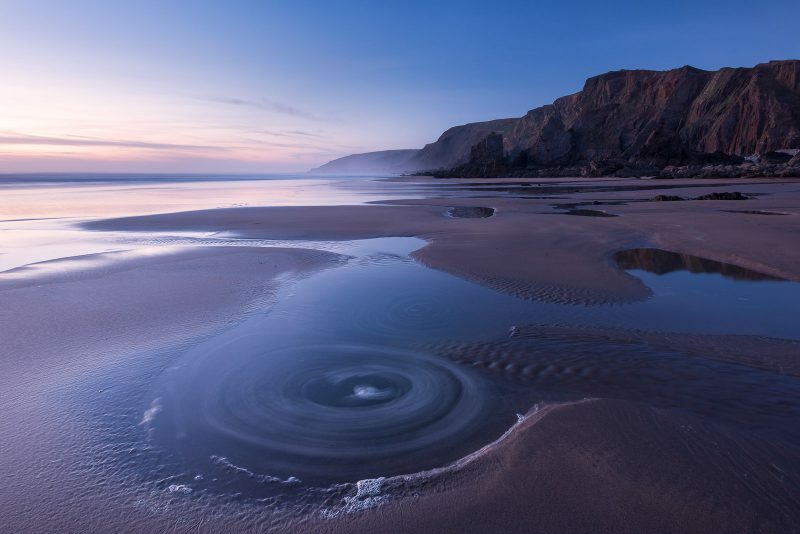 At low water, tidal pools and ripples in the sand create simple, but compelling foreground interest and, being on the north Cornish coast, this is a great location for shooting colourful evening skies. The beach is cared for by the National Trust, and there is a seasonal café located close to the car park. The tide can advance quickly here, so wear wellies if you plan on taking photos close to the water’s edge. 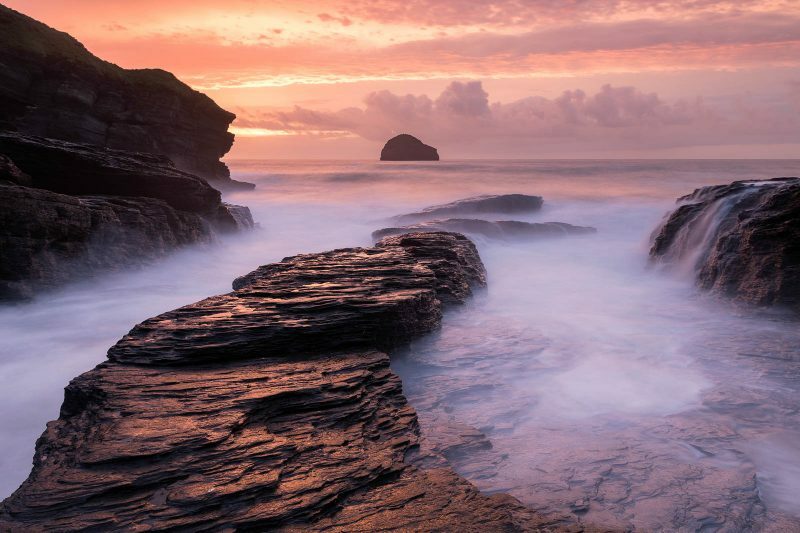 Trebarwith Strand at sunset and high water, Trebarwith, north Cornwall, UK. October 2017. This is one of my favourite places to photograph in north Cornwall. Located just south of Tintagel’s legendry castle ruins, low tide reveals a large sandy bay contained by high, towering cliffs. There are dark, natural caves to be found and explored; while a stream flows down to the beach, carving its way through the rock. Out to sea is Gull rock, which provides a distant focal point in wide-angle shots. Trebarwith is another excellent sunset location. From spring until autumn, the sun remains visible until the moment it disappears below the horizon, enabling photographers to capture wonderful warm sunlight. 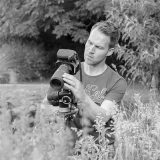 However, in order to control the level of contrast, you will need graduated ND filters – alternatively try exposure blending. The afterglow here can be spectacular, with colour filling the sky and reflecting off the water and shiny slate rock – so don’t head home too soon. Personally, I favour either a very high or low-tide when visiting. Bedruthan Steps and pink thtrift (Armeria maritima), storming evening sky and light, nr Newquay, North Cornwall, UK. May 2013. The north Cornish coastline is wild and imposing, with Bedruthan Steps being the jewel in the crown. Located just north of Newquay, there are National Trust car parks at both Carnewas and Park Head, and the coastline stretching between these two points is among the finest you will see anywhere. Park at the main Carnewas car park, where there is café and toilets. From here, join the coast-path and walk north. The views are spectacular throughout the year. In stormy weather, massive waves will crash against the large sea stacks located on the beach below. At low water, a large and inviting sandy beach is revealed, which can be accessed by a steep staircase. I prefer the cliff top views, though, with the elevation providing far-reaching views – both north and southwest – along the Cornish coast. Evening light is best and, during spring, thrift – or sea pinks – adorn the cliff tops. Holywell Bay, low tide at sunset, Carters Rocks, tidal pools and reflections, near Newquay, Cornwall, UK. April 2017. 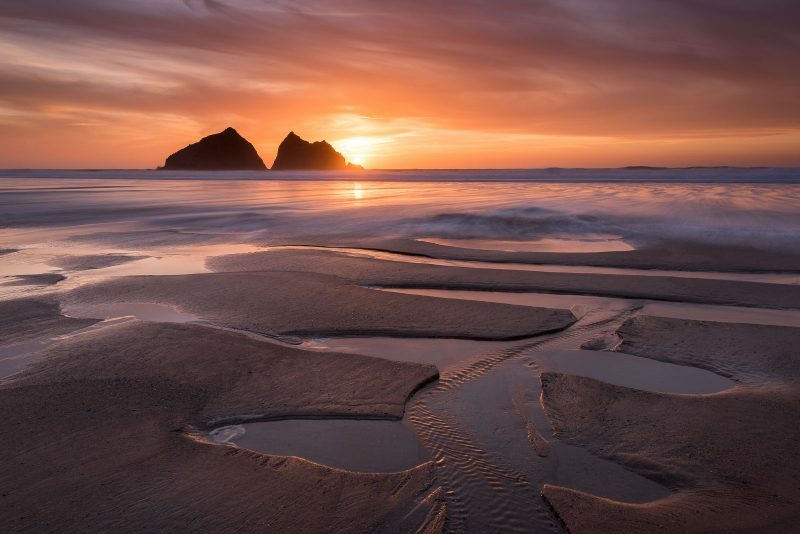 Holywell Bay – located a few miles southwest of Newquay – is growing in prominence due to being featured regularly in the BBC’s latest adaptation of Poldark. This large, open bay is backed by large sand dunes, rising up to 20m in height. 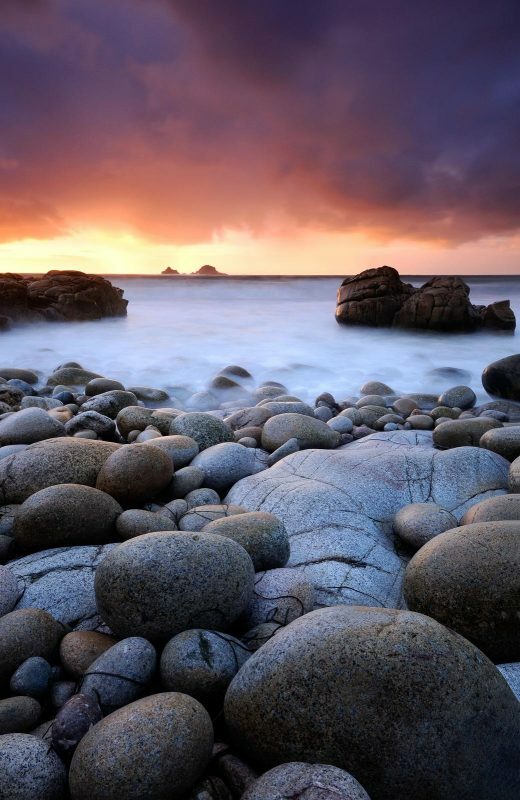 Out to sea is Carter’s Rocks, a small distinctive island that provides an ideal focal point to wide-angle seascapes. Tide height can greatly influence the look of a location and the photos you are able to capture. Therefore, use a good tide App like Ayetides for local tidal information – this is important for safety too. At Holywell Bay, low tide will often reveal beautiful, wavy sand patterns and tidal pools, while at high tide, it’s better to venture into the dunes and include swaying marram grass as foreground interest. This is yet another good sunset location. 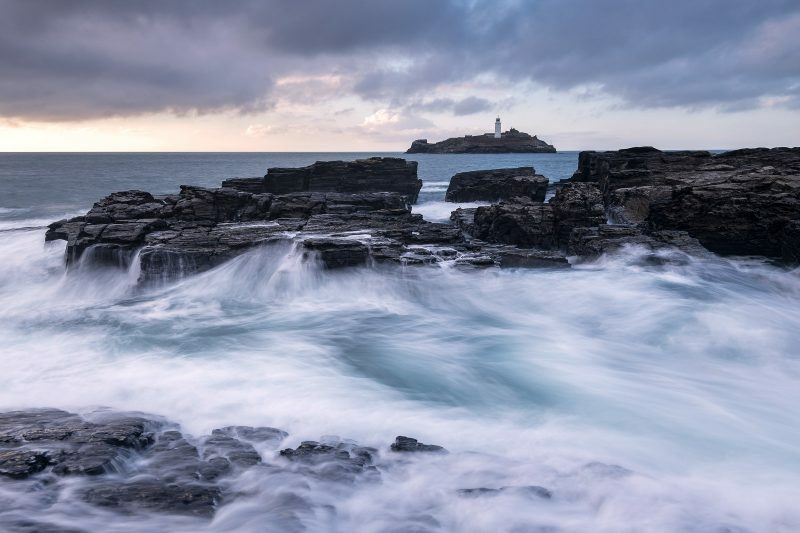 Godrevy lighthouse at high tide or stormy afternoon, near Hayle, Cornwall, UK. October 2017. Just a short drive from the town of Hayle, is Gwithian Towans and Godrevy Lighthouse. This is another stretch of coastline cared for by the National Trust and there is a large beach car park and café here. The white 26-meter octagonal lighthouse is situated on a small island, a couple of kilometers out to sea, providing a great focal point in photographs taken from the beach. This is a good location at a mid to high-tide, when large, crashing waves can add interest and drama to shots. Don’t forget to take along your solid ND filters if you fancy shooting some long exposure seascapes, but be mindful of big waves when shooting from the rocky beach. Thrift carpets the coastal cliff tops in spring, while you will often spot seals bobbing in the water – there is a large colony just around the corner. 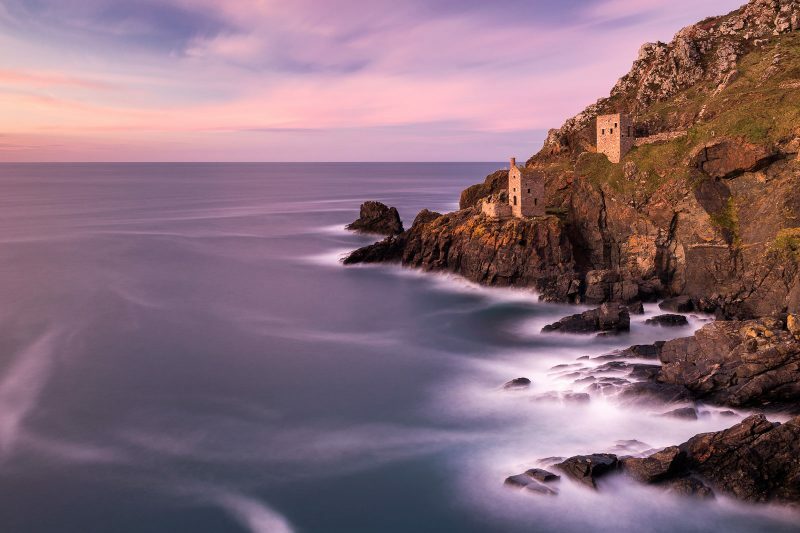 The Crowns Engine House, Botallack, sunset and high tide, Poldark Country, West Cornwall, UK. November 2017. 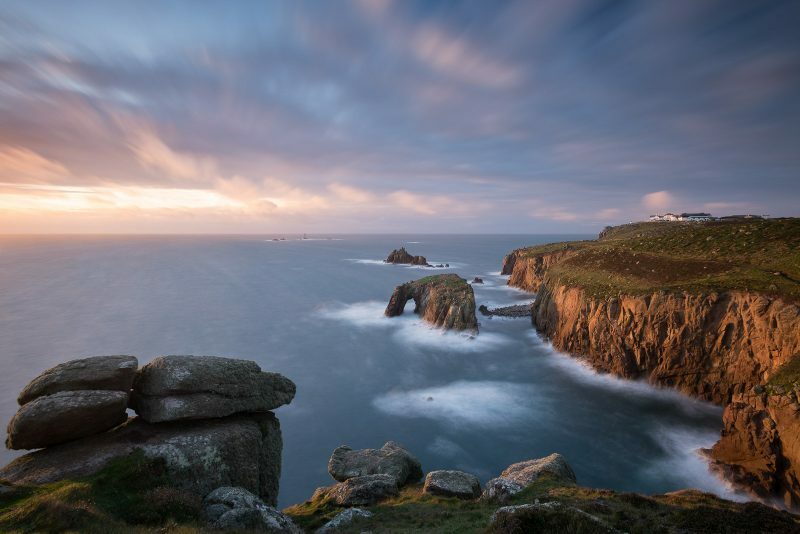 Continue your journey into the most southwesterly area of England – the Penwith Peninsula. This is Poldark country and home to Cornwall’s mining heritage. Follow the B3306 to the village of Botallack and follow a rough track to the National Trust’s Old Count House visitor centre. Here you find the remnants of engine houses and tall industrial chimneys stretching along the coastline in both directions. By far the most photogenic is The Crowns Engine Houses, dramatically perched at the foot of the cliffs, just above the sea. This is one of Cornwall’s most recognizable and photogenic landmarks. It is best to visit in the evening and at a high tide. If your mobility allows, clamber down the opposite slope facing them in order to achieve a natural looking parallel viewpoint. Carry a versatile range of landscape lenses. A short telephoto length, in the region of 50-70mm, will often work well. Porth Nanvan SSSI (Cot Valley) looking toward the Brisons, Cornwall, UK. Evening light. November 2008. Admittedly, the Cot Valley is not the easiest beach to find, being located at the very end of a narrow minor road from the village of St Just. However, you can’t visit Penwith without shooting this unique and hugely photogenic bay. The beach is covered in large, beautiful oval boulders that resemble dinosaur eggs. They create amazing foreground interest, particularly when captured from a low, wide perspective. At low tide, a small stretch of sand can be revealed and out to sea are a couple of small islands called The Brisons. A tide height in the region of 2-3m is often desirable and, yet again, this is a location best shot at last light. The rocks here are so beautifully sculptured that it is worth considering shooting black and white in order to place emphasis on their shape and form. Enys Dodnan Arch, the Armed Knight rock and Longships lighthouse, Land’s End, Cornwall, UK. October 2016. You can’t visit Cornwall without venturing to Land’s End. There is a large pay and display car park next to the complex, but the complex itself is rather ugly and underwhelming. However, if you follow the coast path away from the shops and hotel you will be rewarded with great elevated vistas of this incredible stretch of Cornish coastline. Walk to Pordennack Point to capture the breathtaking coastline looking southeasterly. However, few visiting photographers will be able to resist shooting the classic view of Land’s End, looking back towards the complex and including Longships Lighthouse, The Armed Knight and Enys Dodnan rock arch. A colourful sunset or dark, moody sky will add further drama to your landscape shots. St Michael’s Mount reflected at sunrise, Marazion, West Cornwall, UK. October 2017. This is arguably Cornwall’s most recognisable landmark – it is also one of its most photogenic. Mounts Bay is one of the most beautiful bays in Europe, with mile upon mile of golden sands and far reaching views towards the Lizard. 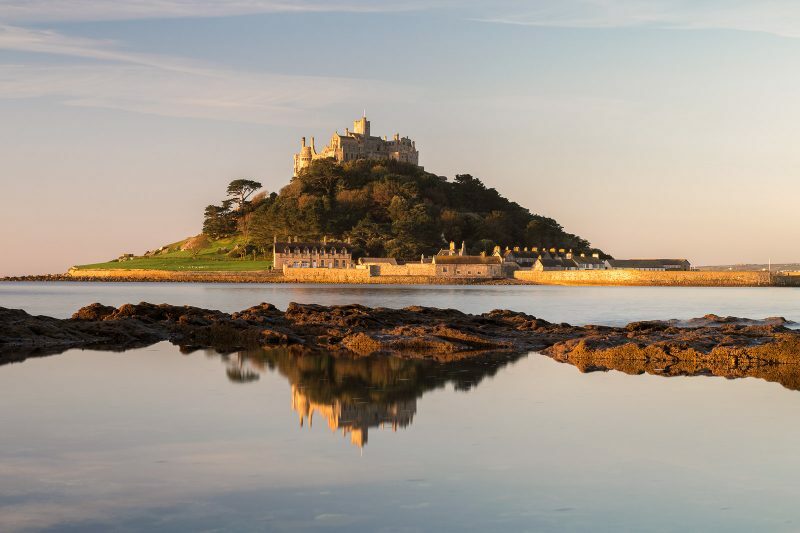 At low tide you can walk to St Michael’s Mount – a small island with a harbour, shops, gardens and a majestic castle. The island is linked to the mainland via an old, attractive stone causeway. This provides a perfect lead-in line when composing shots of the Mount, effectively directing your eye through the image to the island. The rocky beach provides other interest too – including rock pools and ripples in the sand. At higher tides there is a concrete slipway that can be used to create a strong composition. The mount can be shot at any time of the day, but morning is typically best – when there are fewer people about and the island will be attractively side-lit. A wide-angle lens and an assortment of landscape filters are a must have when you visit. 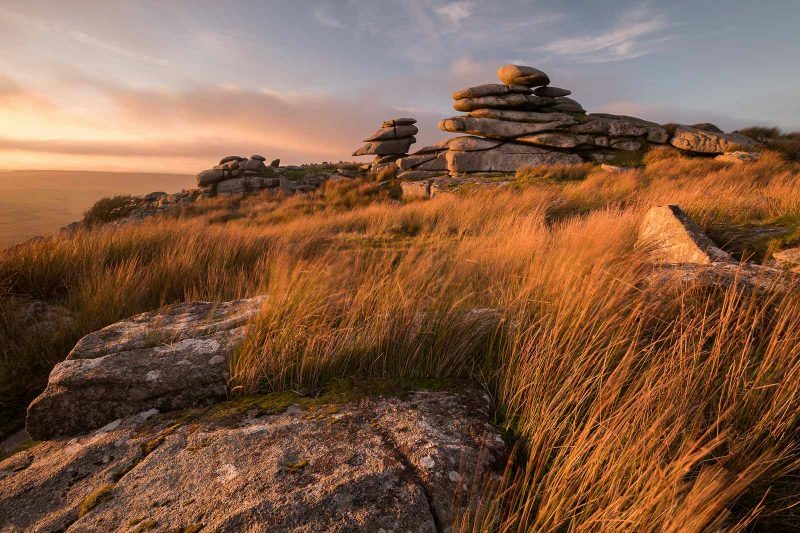 Stowe’s Hill bathed in late evening light, Minions, Bodmin Moor, Cornwall, UK. September 2017. 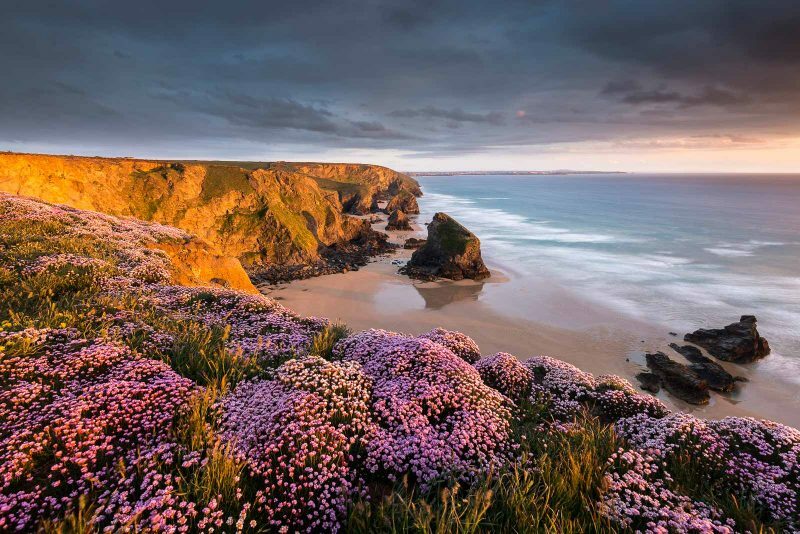 Unsurprisingly, this location guide focus primarily on Cornwall’s famous coastline, but the county is home to large areas of wildness and moorland too. At a height of 381m, Stowe’s Hill is located on the eastern side of the moors (near the village of Minions) and boasts superb, far-reaching views. This is a site with Neolithic and Bronze Age remains and home to the oddly named Cheesewring – a distinctive, sculptured rock formation which stand’s on Stowe’s Hill. There is ample parking on the fringe of Minions village and it takes approx. 20mins to walk to the top of this rugged hill. You will pass a handful of windswept hawthorns on your walk up, which can look striking photographed in isolation or captured in black and white. A moody, stormy sky and late evening light will provide the final ingredients for great landscape photography.